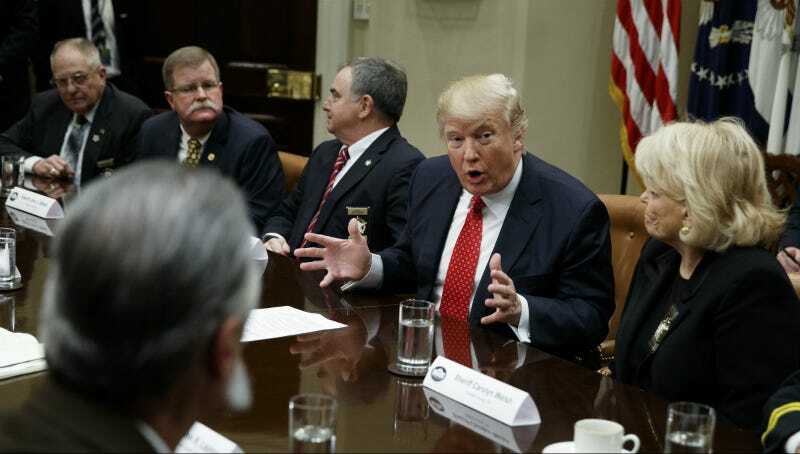 Donald Trump met Thursday with county sheriffs from around the nation, where he took the opportunity to assure everyone he’s tough on crime, pro-building that wall, and loves casual, party-time revenge. “There’s a state senator in Texas that was talking about legislation to require conviction before we could receive that forfeiture money,” Eavenson said. “Do you believe that?” Trump replied. “And I told him that the cartel would build a monument to him in Mexico if he could get that legislation passed,” Eavenson added. “Who is that state senator? Do you want to give his name? And we’ll destroy his career,” Trump said genially, in what I think the White House will probably pass off as a joke. SB 156 raises the burden of proof from a preponderance of evidence to a clear and convincing standard the state must prove in asset forfeiture cases. The heightened legal burden placed on the state will not interfere with our law enforcement agencies’ ability to do their jobs, is an important protection for Texans’ property rights and civil liberties. You can read the full text of the bill here. Donald Trump is feeling happy again after his nice meeting and good joke, which will hopefully tide over his voracious, bottomless need for approval and praise for the remainder of the day.